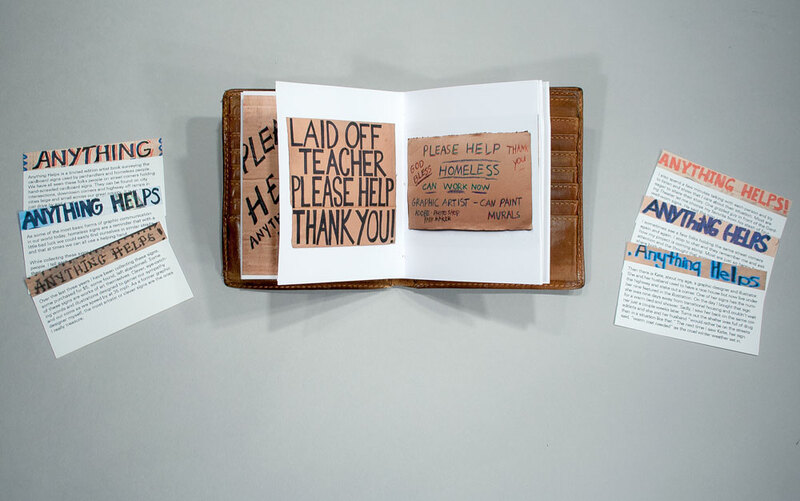 Anything Helps is a limited edition artist book surveying the cardboard signs used by panhandlers and homeless people. 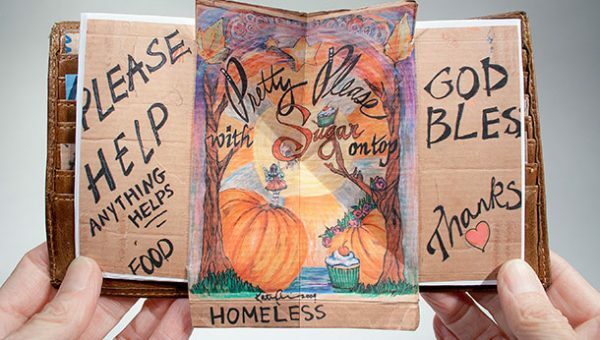 We have all seen these folks people on street corners holding hand-scrawled cardboard signs. They can be found on city intersections, downtown corners and highway off ramps in cities large and small across our great county. It is so easy to just drive by and avert our eyes as we pass a homeless person on the street corner. It is my hope that this book will make us stop and reflect upon the lives we look at every day but never really see. Over the last three years I have been collecting these signs, some purchased for $5, some found, left abandoned. Some of these signs are works of art themselves. 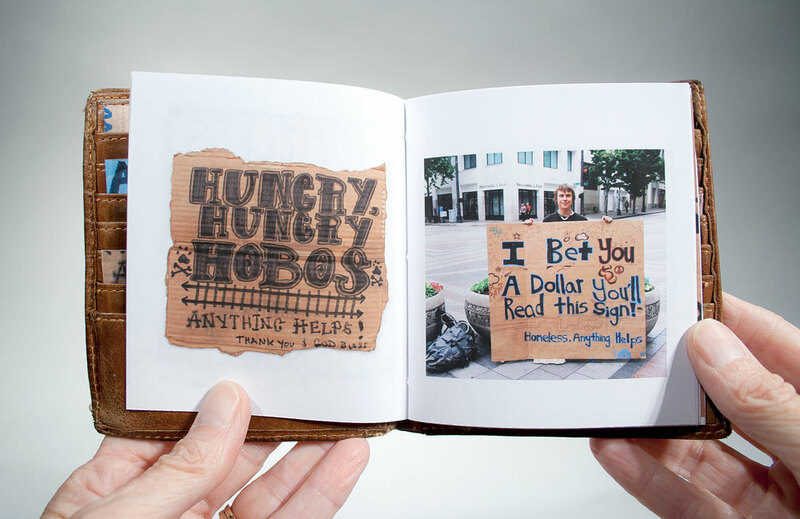 Clever, eye-catching words and illustrations designed to garner our sympathy and our coins as we speed by at 35 mph. As a former graphic designer myself, the most artistic or clever signs are the ones I really treasure. 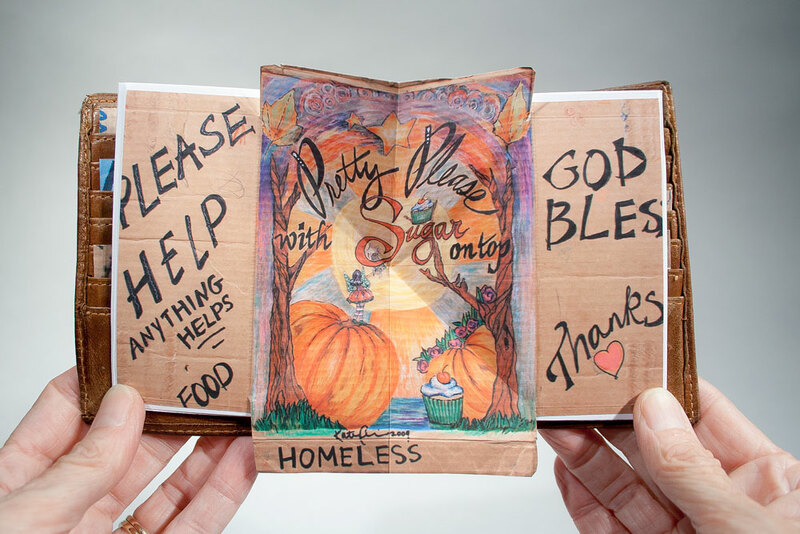 As some of the most basic forms of graphic communication in our world today, homeless signs are a reminder that with a little bad luck we could easily find ourselves in similar straits—and that at times we can all use a helping hand. While collecting these signs I have met some fascinating people. I tell each person that I am doing an art project with their signs. Most think that the $5 offered is an unbelievable sum and are happy to hand over their sign. Often they just pull another sign out of their backpack. I also spend a few minutes talking with each person and try to listen and show that I care about their situation. Most are eager to share their story. One grizzled guy in front of the Gerding Theater let me choose my favorite from his stash of four well-worn signs. He said the sign I chose, which reads, “Even Pennies Help” was his luckiest one and that “we have been through a lot together.” He then proceeded to put his signature on the back of the sign. It reads, “HH” which stands for Hitch Hiker, which he also proudly revealed tattooed above his back shoulder in hand-scrawled, prison-style tattoo ink. 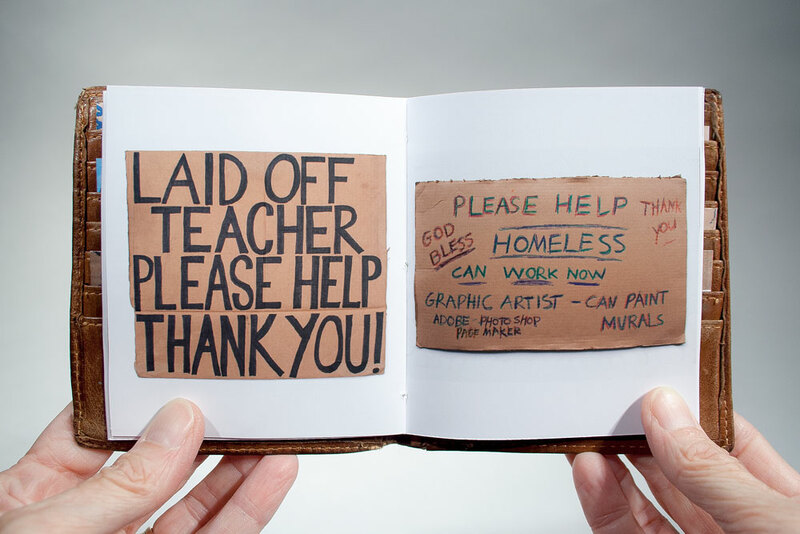 Then there is Kate, about my age, a graphic designer and illustrator, homeless with her husband. I bought my first sign from her for $5 then commissioned her to make a new sign for me and name her price. Katie and her husband used to have a house in Sellwood but now live under the highway in the Hollywood district and stake out the corner near the I-84 off ramp. One of her signs has the number nine featured in the illustration. On the day I bought that sign she was nine days away from transitional housing and couldn’t wait for a warm bed and shower. Sadly, I saw her back on the same corner just a couple weeks later. Turns out the shelter was filled with drug addicts and she and her husband “would rather be on the streets than in a situation like that.” The next time I saw Katie, her sign said, “warm coat needed” as the cruel winter weather set in. I sometimes see a few folks holding the same street corners again and again. I stop to chat and they remember me and ask how my project is coming along. Most are just so happy for the attention and the thought that someone cares. They are glad to share both their stories and their signs. 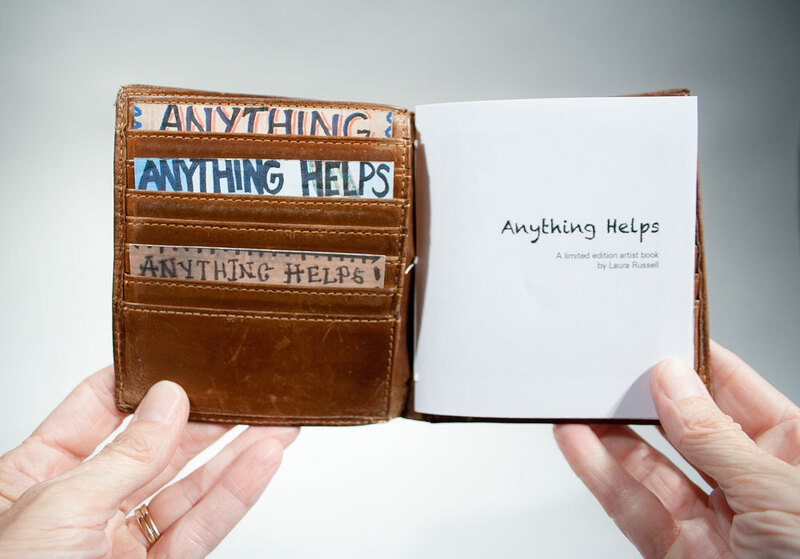 Pamphlet stitch booklet sewn into vintage billfold wallet plus six cards telling the stories behind the photographs that fit inside credit card slots. Archival digital printing on Red River Polar Matte paper. Turkish map fold center spread with pop-out sign. 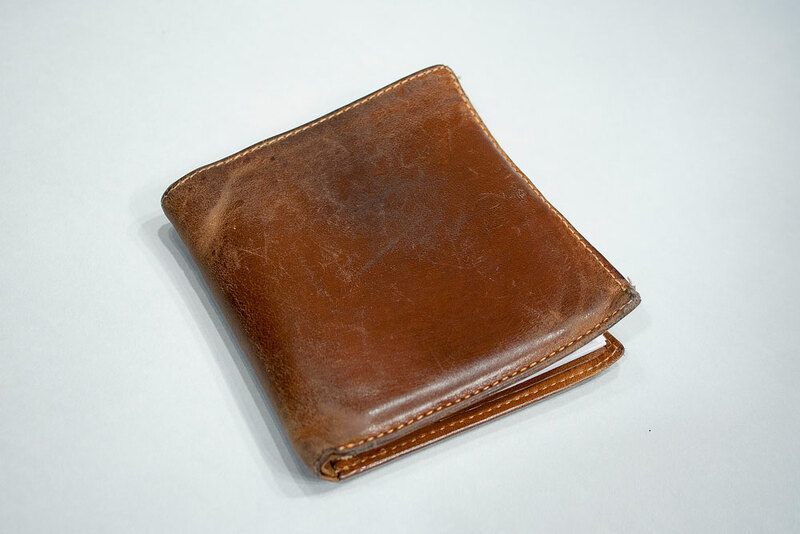 Dimensions when closed: variable, approx 4.25 x 4.5 x .5 inches. 32 pages. Edition of 25. 2013.